I don't usually write posts this far in advance about movies coming out, but this film looks fantastic, with a great cast as well. It has the song "Seven Devils" in the trailer (Florence and the Machine) which I've been obsessed with since last season's Revenge finale, and the film looks like Practical Magic meets Alice in Wonderland meets The Skeleton Key. I'm definitely excited to see this movie once it hits theaters. The movie comes out on February 14, 2013. See below for the trailer. 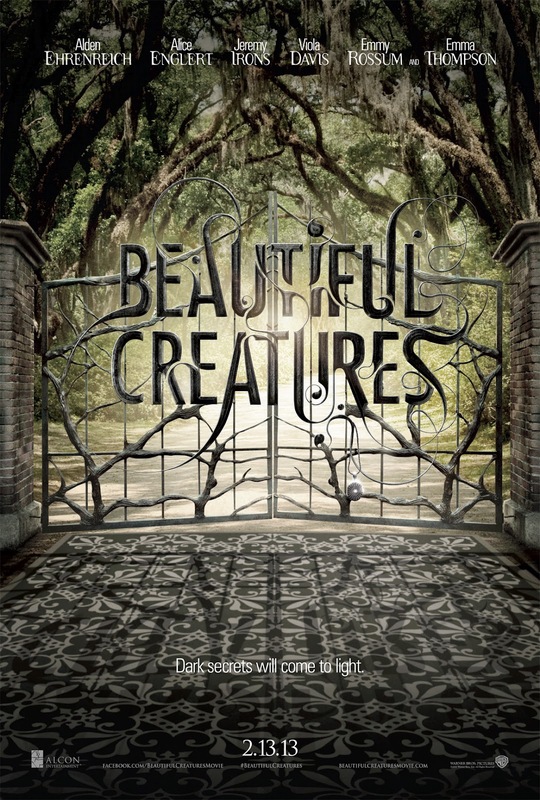 A supernatural love story set in the South, “Beautiful Creatures” tells the tale of two star-crossed lovers: Ethan (Alden Ehrenreich), a young man longing to escape his small town, and Lena (Alice Englert), a mysterious new girl. Together, they uncover dark secrets about their respective families, their history and their town. Oscar® nominee Richard LaGravenese (“The Fisher King,”“P.S. I Love You”) directs from his adaptation of the first novel in the best-selling series by Kami Garcia & Margaret Stohl. The film stars Alden Ehrenreich (“Tetro”), newcomer Alice Englert, Academy Award® winner Jeremy Irons (“Reversal of Fortune”) Oscar® nominee Viola Davis (“The Help,” “Doubt”), Emmy Rossum (TV’s “Shameless”) and Academy Award® winner Emma Thompson (“Howard’s End,” “Sense and Sensibility”). Erwin Stoff (“Water for Elephants”) is producing with Academy Award® nominees Andrew A. Kosove and Broderick Johnson (“The Blind Side”), Molly Smith (“Something Borrowed”) and Oscar® nominee David Valdes (“The Green Mile”). The behind-the-scenes team includes Academy Award®-winning director of photography Philippe Rousselot (“A River Runs Through It”), production designer Richard Sherman (“Gods and Monsters”), editor David Moritz (“Jerry Maguire”) and Oscar® -nominated costume designer Jeffrey Kurland (“Bullets Over Broadway”). 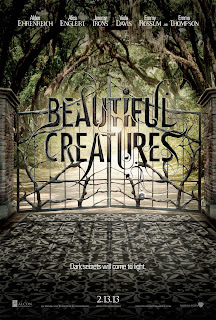 Opening February 13, 2013, “Beautiful Creatures” is a presentation of Alcon Entertainment and will be distributed by Warner Bros. Pictures, a Warner Bros. Entertainment company.